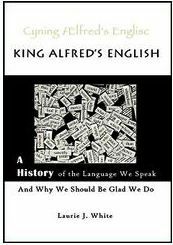 King Alfred’s English: A History of the Language We Speak and Why We Should Be Glad We Do was written by Laurie J. White as a way to bring the history of our language to students in grades 7 through 12 in a fun and engaging manner. Laurie fell in love with the history of the English language after taking it as a college course; it made the study of key parts of history, English and even foreign language come alive. King Alfred’s English looks at how the growth of the English language through four key invasions, or as Laurie puts it “language altering tsunamis,” both broadened and simplified English into the language we speak today. Further, Laurie discusses how the advent of the printing press was not only a boon to language, but helped with the dissemination of the Bible to the common people aiding the Protestant Reformation and molding the vernacular. She explores the work of Wycliffe (pre-printing press), Martin Luther and Tyndale. As the book marches through history, the reader learns that many of the words with the SK sound come from the Old Norse, ph comes from Greek, how the advent of printing solidified spelling, why the Great Vowel Shift changed pronunciation and the lasting effect of Greek and Latin on the “roots” of English. Answers to why we spell knight with a kn and other mysteries of spelling are illuminated. So that’s why our spelling is so strange! Visit Laurie’s website, The Shorter Word.com, to find both Student and Teacher resources. Using her suggested minimum requirements, the book and free supplemental material she provides can be used as a 1/2 credit high school history course, or a combined 1/4 credit history and 1/4 credit English course. Resources include suggested readings and links, worksheets, tests and writing activities. A big thank you to April of Eclectic Montage for writing this introductory post. I LOVE THIS RESOURCE!!!! =) It’s excellent! This was such an enjoyable book to read. It exceeded my expectations.